From the author of A-MAZE-ING Animals and Myths & Monsters running weekly in the Sunday Telegraph! Here comes another wonderfully wacky collection of mazes from Joe Wos . . . and this time, he has gone the way of the dinosaurs! 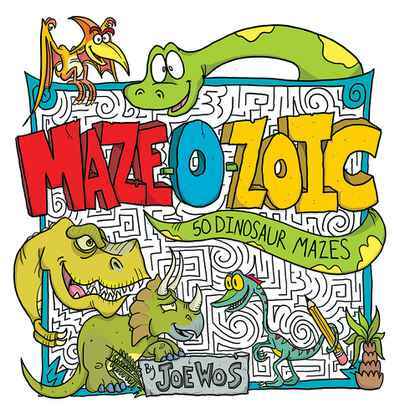 MAZE-O-ZOIC features 50 colourfully illustrated mazes with fully solvable characters, cartoon elements, and dinosaurs along every start-to-finish path. Kids and parents will enjoy navigating through a T-Rex-inspired maze, the Triceratops' horns, the Spinosaurus' amazing sail, and more. Open the pages and get lost in this prehistoric world that's filled with twists, turns, and scary good fun! There are dozens of dead ends, illusions, twists and turns that increase with the difficulty level. It’s not just thoroughly entertaining…it’s absolutely A-MAZE-ING!